At Blizzard Data Recovery we try to make it affordable to get your data back. Conventional USB stick recovery starts at $135. Here are some descriptions and pictures so you can compare your USB pen drive to devices that qualify for our conventional USB device recovery pricing. 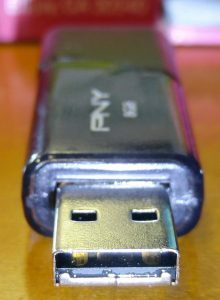 Less common monolithic USB flash devices are charged an additional $200. Do I have a monolith? 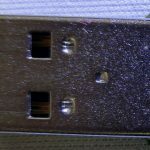 If your thumb drive has a metal USB connector like the picture to the right then it is most likely recoverable for our standard rates, but there are a few exceptions (See photos below). 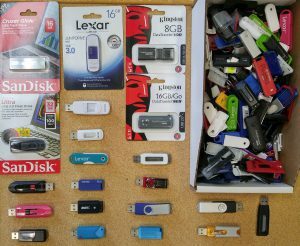 Here is a picture of some of the common USB flash drives that we do recover as well as a bucket of shells from devices we have worked on. You can click the image to enlarge it. 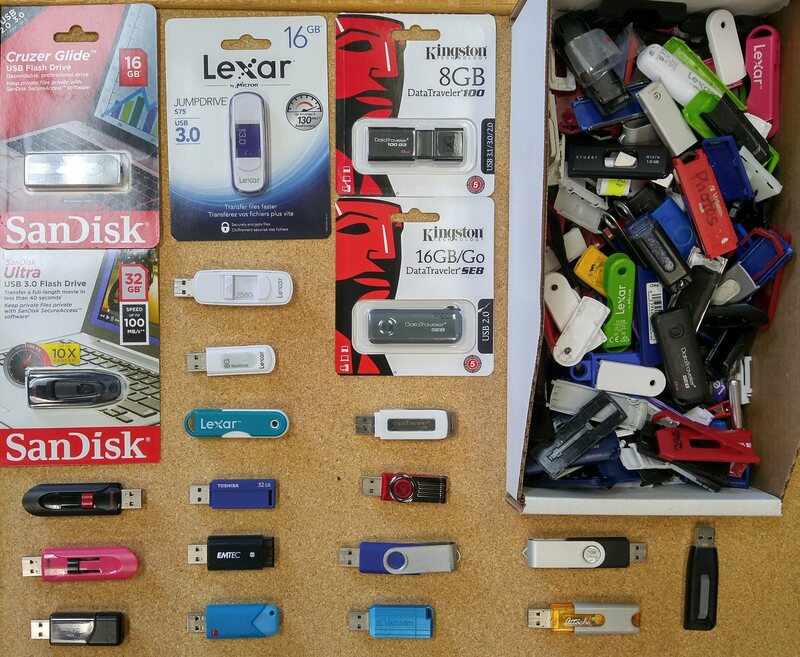 There are thousands of different shapes and sizes of USB flash drives that we can recover. Another factor is size, if your flash device is more than 1.5 inches long then it is most likely a conventional device. Why does size matter? There are some monolithic flash devices that we charge extra for, but many of them are under 1.5 inches in length (excluding PNY and some newer Sandisk). For conventional failed or broken USB flash drives we can often replace failed components to temporarily repair and recover your data. We also specialize in removing the memory chip (NAND) and recovering your data when the device cannot be repaired. Monolith devices do not have surface mounted components like fuses, resistors, capacitors, oscillators, so we can’t replace them. They also don’t have the typical TSOP or BGA chip package that we can remove and read in our NAND readers. In most cases monolith devices require invasive work and complex data reconstruction. To the left you can see two same model Sandisk Ultra 64GB USB devices. 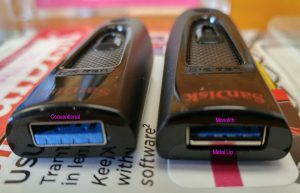 The one on the left is a conventional device and the one on the right is a monolith, but the package presents them as the same model. Click the picture to enlarge and see the difference. For full size devices you can often tell a monolith because it has a metal lip across the bottom of the connector area. The monolith version of these Sandisk Ultra’s have recently been seen coming from Amazon and Walmart (2018-06-14). 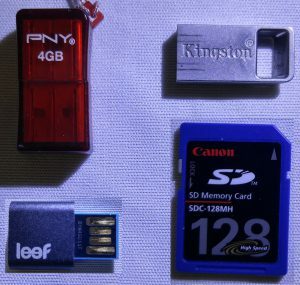 To the right is an example of some short monolithic USB devices and memory cards that would be charged extra. Are you ready to get your data back? Start here! Or you can review our flash drive recovery pricing. Below you can see an 8GB PNY USB that is a monolith. 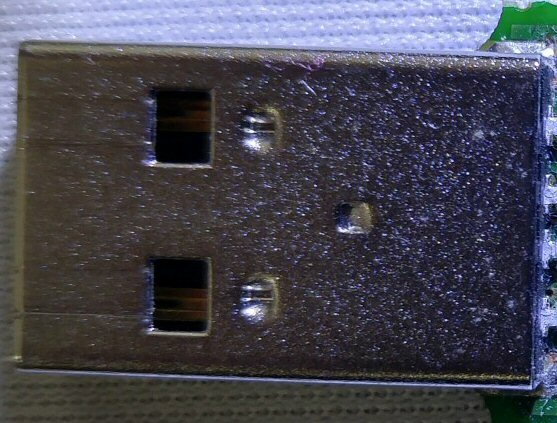 You can tell by the large metal retaining bar at the bottom of the USB connector.